If the previous video wasn't enough to convince you that China is capable of deception on a grand scale, then surely this video will. 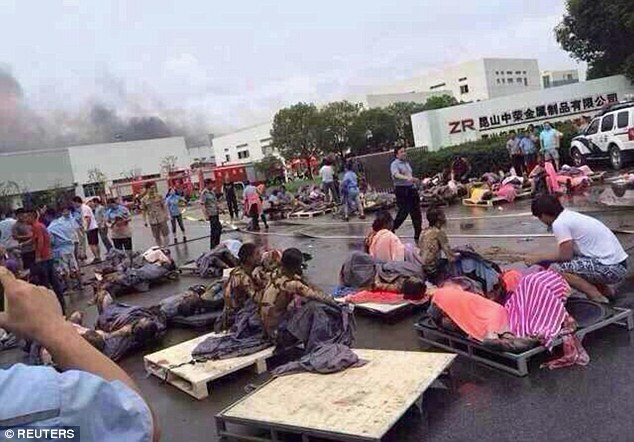 The video is labelled 2014-08-02 Kunshan Car-Parts Factory Explosion. It is a 2014 explosion at a General Motors supply factory: Zhongrong Metal Products in Kunshan, Jiansu province. (See this Daily Mail report for details). As you can see on the video, the scene looks more like lunchtime on the set of a Hollywood horror movie, rather than any real event. The motive for this is pretty simple, to attack a foreign company. Typically, China invites foreign companies to set up shop in China, until such time as they have acquired all their technological secrets, and then suddenly they find themselves attacked and unwelcome. So, it should be apparent by now that China is capable of grand deception, even on the scale of the Tianjin explosion. The next post will speculate about why Tianjin, and other global "accidents", are happening.